WATERLOO –Wilfrid Laurier University is seeking submissions for the 2016 Edna Staebler Award for Creative Non-Fiction, a $10,000 literary award that recognizes excellence in Canadian creative non-fiction. Designed to encourage new Canadian talent, the award is open to authors who have published a first or second book with a Canadian locale and/or significance. The 2016 award is open to works published in the 2015 calendar year and distinguished by first-hand research, well-crafted interpretive writing and a creative use of language or approach to the subject matter. Entries must be received by April 30, 2016 to be considered. To obtain an entry form and a complete list of submission guidelines, please visit wlu.ca/staebleraward. The shortlist and winner will be announced in the early fall. The author will be presented with the award and make appearances at Laurier’s Waterloo and Brantford campuses in the fall. Lynn Thomson was the winner of the 2015 Edna Staebler Award for Creative Non-Fiction for her book, Birding with Yeats: A Memoir (House of Anansi Press). Birding With Yeats recounts Thomson’s efforts to support her son, Yeats, a solitary young man who has trouble finding his way in the world. As much about the bond between a mother and a son as it is about bird-watching, Birding With Yeats is an elegantly written, engaging memoir. Other past winners of the Edna Staebler Award include authors Arno Kopecky, Carol Shaben, Linden MacIntyre, Wayson Choy and Elizabeth Hay. 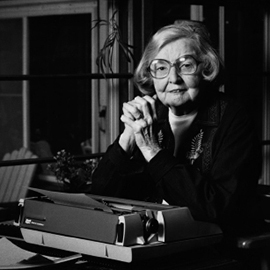 Established and endowed by writer and award-winning journalist Edna Staebler, the Edna Staebler Award for Creative Non-Fiction is administered by Wilfrid Laurier University, the only university in Canada to bestow a nationally recognized literary award. The $10,000 award encourages and recognizes Canadian writers for a first or second work of creative non-fiction that includes a Canadian locale and/or significance. The award was established in 1991.